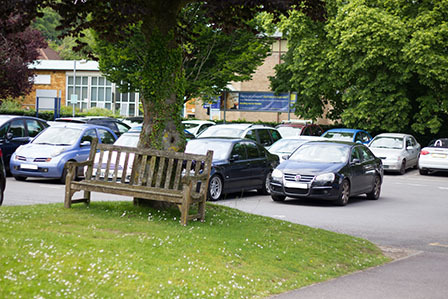 Parking is available onsite, but there are only a limited number of bays for both staff and students. These are available on a first-come, first-served basis. The car park is for staff and students only and whilst studying. When parking onsite, please park in the designated parking bays. Parking in non-designated areas obstructs delivery vans and prevents access for emergency vehicles. By obstructing others your car is also at a greater risk of accidental damage. As spaces are limited, please be considerate of other users and only park for the duration of your lesson. Please note that new parking restrictions now apply in the surrounding area. Please ensure you check local signs and park with consideration to our neighbours. Click here for further information about the restrictions or see the Winchester City Council website. A limited number of parking permits are available for student use - please enquire at reception. There is £25 fine for parking onsite if you are not a student attending a course on that day or a student who has signed in at Reception. Do not park in Acorn Close in order to avoid traffic wardens and prosecution from parking on private property. Buses - there is a good service to and from the city. Peter Symonds College accepts no responsibility for your parking choice.